Anti-War protesters say ‘No’ to Klobuchar presidential bid | Fight Back! 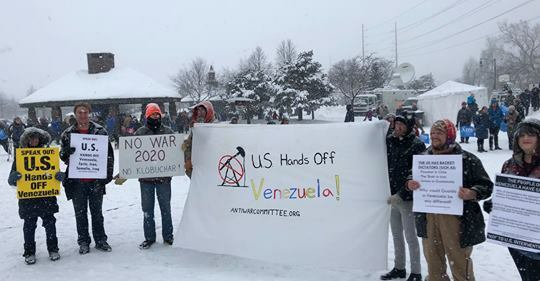 Minneapolis, MN - A contingent of demonstrators braved the cold and dense snowfall, February 10, establishing an anti-war presence at Boom Island Park, where Minnesota Senator Amy Klobuchar announced her 2020 presidential bid. Klobuchar has a long history of voting with Republicans on the issues of foreign intervention and militarism, to include voting “Yea” on bills that imposed economic sanctions on Syria and Iran, added $61 billion to the defense budget, extended the expiration date of the PATRIOT Act, and authorized President Trump to transfer precision guided munitions to the Israeli apartheid regime. She also has expressed, in interviews leading up to the government shutdown, her willingness to capitulate to the Trump administration's demand for funding for the proposed inhumane wall at the U.S.-Mexico border. This record led members of Women Against Military Madness, Veterans for Peace, Minnesota Peace Action Coalition, and the Anti-War Committee to make their voices heard at Senator Klobuchar's rally. The contingent utilized the opportunity to bring attention to the tendency of mainstream politicians, including Klobuchar, to advocate for sanctions, intervention and regime change in the sovereign state of Venezuela, with signs that illustrated the U.S. moves to install brutal dictators in Latin American countries. As the 2020 presidential election cycle begins to ramp up, it is as important as ever to understand the fact that the Republicans are not the only political party in the U.S. that advocates for militarism and intervention in the affairs of other sovereign states. Senator Klobuchar is in lockstep with the current Republican majority in these matters and will likely continue the legacy of pro-war Democrats.